This is an extract from [amazon text=Project Pain Reliever&asin=160427039X]. I contributed this chapter (and another one) to the book. This one is about ensuring everyone buys into the project schedule. Hans had spent a lot of time working on his project plan. He knew what needed to be done and how long everything would take. Requirements gathering, that would take a couple of days, right? There weren’t that many users to ask, after all. Hans proudly projected the schedule on to the wall of the meeting room. “Looking at this, we’ll be done by June,” he said to the team. Their faces were incredulous – and they didn’t seem at all pleased that he had saved them so much time by doing all the work for them. Hans had completely misinterpreted what needed to be done to deliver this project. He now realised that he hadn’t understood what was involved in some of the tasks, and he had even missed some out. The only good thing was that he hadn’t yet shown the schedule to his project Sponsor. He needed a new plan, and quickly – he was due to present the schedule to the Sponsor that afternoon. You have a great project plan, with lots of detail. It’s properly documented and you have built a schedule that gets everything done by the date the Sponsor wants. However, now the team have started working on the project, it is clear that they are sticking to their own timescales and not paying any attention to your masterpiece. In fact, at the last team meeting they went as far as to tell you that your schedule is completely unrealistic. OK, you missed out the testing phase, but surely that won’t take very long? Everyone is doing what they can, and the team is working long hours to get tasks completed on time, but they are starting to resent the fact that you signed them up to this. 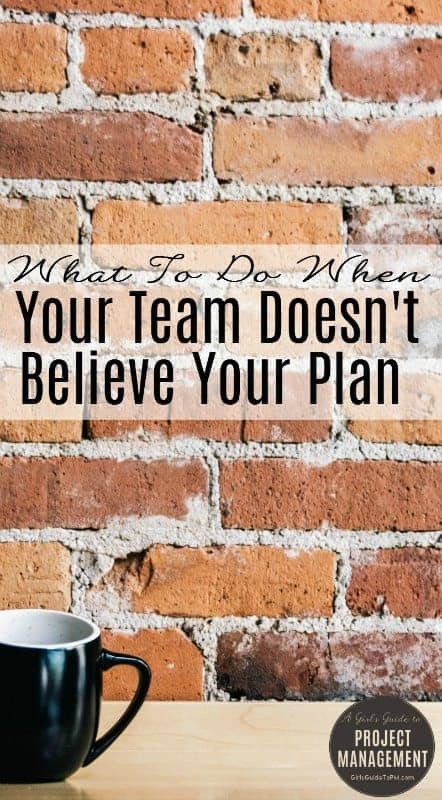 You don’t know how long you can keep the project going when it’s obvious that the team doesn’t believe in the plan or the schedule. 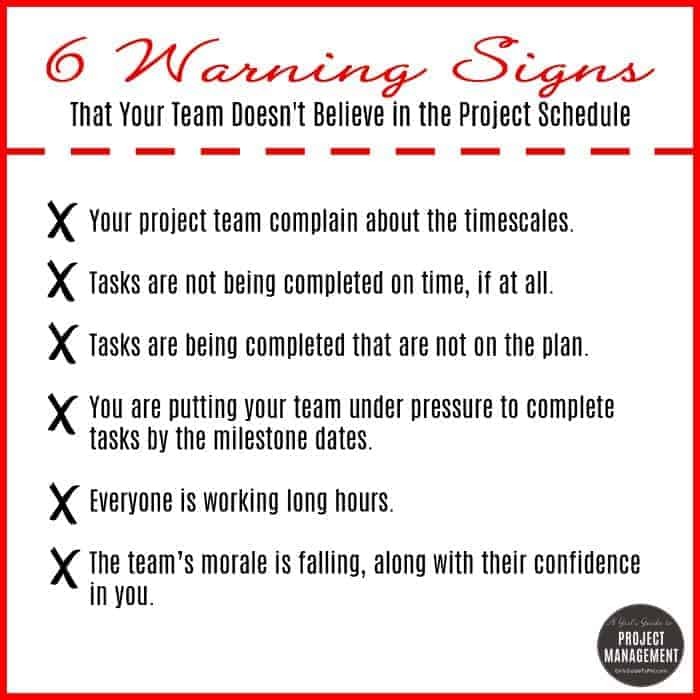 What can you do if your team doesn’t believe in your project schedule? Your project team complain about the timescales. Tasks are not being completed on time, if at all. Tasks are being completed that are not on the plan. You are putting your team under pressure to complete tasks by the milestone dates. Everyone is working long hours. The team’s morale is falling, along with their confidence in you. The project will get later and later and tasks are not delivered on time. The Sponsor will become more disillusioned with your ability to deliver on the promise of your schedule. In turn, you may put more and more pressure on your team to speed up – risking cutting corners and delivering a low quality product that is not fit for purpose. Morale in the team, and their willingness to work with you, will fall. Eventually you might find that they won’t work on your projects at all, and you’ll gain a reputation for being a slave driver whose projects always run late. You can’t plan in a vacuum. At the end of the day, it’s not you who will be doing all the tasks – that’s what the members of the project team will do. So involve them in working out what needs to be done to meet the project objectives and how long it will all take. A complete list of tasks required to deliver the project. Get the key members of your team altogether to work out a new, realistic plan and schedule that they can all buy into. Acknowledge that your current working plan is no good and that you need to set a new baseline against which to track progress. Essentially, you are starting to plan this project from scratch, and you need their help. Here are the three things to do next. As a group, review all the work breakdown structures and plans you have so far. The person doing a job will have a better understanding of what it actually involves than you ever will. So let them tell you what is required to get the task done. What is missing from the original plan? How does the task break down into sub-tasks? If you can, delegate the creation of sub-plans to the workstream leaders. The aim here is to get a comprehensive list of what needs to be done to achieve the project’s objectives. Rely on your experts to help you develop this list – it will help them feel more accountable for the deliverables, and more comfortable with the overall plan. What order do the tasks need to be completed in? What tasks can be run in parallel? What can be started early? Who needs someone else to have finished before they can start? What needs to finish at the same time as something else? Once you understand the order of tasks and their dependencies you can start putting in some dates. The team didn’t think much of the original schedule you created, so this time ask them for their input. They have probably spent more time carrying out this type of work, and unless it is a unique project or they are very new to their job they are likely to have done it before. Given all their experience, they should be able to come up with some realistic estimates for time frames for all the tasks on the plan. Tip: There is no harm in challenging some of the dates – you don’t want the team to be able to pull the wool over your eyes. 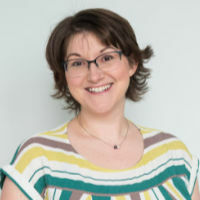 As the project manager you should find a balance between making up the milestone dates yourself and allowing the team to define their own dates so far in the future that they all get to work half days and the project takes ages to complete. Work together to create stretching but achievable target delivery dates. And put some contingency time explicitly in the schedule if you are worried that there is a degree of uncertainty in the estimates. Finally, it’s time to present your new schedule to your Sponsor. It is highly likely that the result of doing this exercise is a project that will finish later than you originally had in mind. It’s difficult to tell a Sponsor that your initial estimates were wrong. However, what you now have is a project plan that you can believe in, deliver to and that is backed by all the members of your team. That’s the message to give your Sponsor. You have a comprehensive list of tasks for the project. You understand the dependencies between tasks. You have worked with your team to set realistic estimates for the duration of these tasks. You have built a credible schedule with input from your team. You are not the expert when it comes to carrying out the work for each of these tasks – so draw on the expertise in the team and involve team members when producing a plan and schedule. You will get better buy in from the team as a result, and everyone will have more confidence that the project will deliver on time. 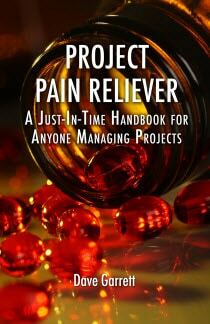 [amazon text=Project Pain Reliever&asin=160427039X], edited by Dave Garrett, is published by J. Ross. Great warning signs checklist by the way! If this was monitored weekly, it would provide a great indicator of team health. Great steps in securing the entire team on a believable plan that everyone agrees on. Communicating throughout the entire process and admitting to needing more time if tasks are taking longer than intended is key to the bottom line: getting the job done. As hard as it is to admit you can’t meet your deadline, updates throughout the process will go over easier than if you wait until the last minute to say that the project won’t be done in time. Definitely! No surprises, that’s what we like. 1. Make sure your team have enough information to make an informed “guesstimate”. The less information you have regarding scope etc, the lower the accuracy of your plan. 2. Build in time for “unknowns”. 3. Build in time for illness, resignations, etc. 5. Negotiate a slightly later end date with your sponsor (if you can), – But don’t tell the team. 6. Fight for your team. Management is all about the bottom line, but you have to manage the well being of every individual on your team. Building in time for sickness is a great strategy. Thanks for sharing, Ron! What about the risks? Risk response plans and time reserves should be a part of the schedule. How do you handle them? Include the time reserves in the plan like any other activity, and when the risk is past, remove and reschedule. That’s what I’d suggest, anyway. How do you do it?